If you have been paying attention to the constant stream of Photokina announcement popping up from all the major camera manufacturers, you may have been expecting this little gem from Canon, the Canon EOS-6D. The latest in their enthusiast line-up, this one sports a 20.2 megapixel full frame CMOS sensor, incredible low light performance with an ISO range of 100-25600 (L: 50; H1:51200; H2:102400) and of course the coveted Full HD 1080p video so respected in modern Canon cameras. Add in features like built-in Wi-Fi and GPS and you have a seriously featured-filled little number. 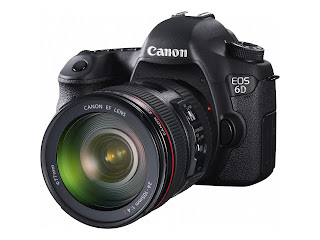 Best of all, it is priced in a range many camera afficionados see as attainable, with quality output and of course the huge range of Canon compatible products at your disposal. Naturally, it has been immediately pitted against the recently released Nikon D600. Brand loyalty aside, which one do you think you would go for? Built in Wi-Fi & GPS ..... nice!